8 - Sharp 123W solar modules @ $675 ea. 6 - 33” #10/2 module interconnects @ $18 each. *Not included are freight, installation, concrete (if ground mounted), wire nuts, roofing material/caulk, or site-specific items necessary for installation. In this system, we specified eight of the Sharp 123W modules since that still keeps us under the 1000W max limit of the inverter’s 1KW rating, and the maximum power point window of the SB700U 200 inverter (100 to 200V) is a good match for eight Sharp 123’s (8 x 17.2V = 137.6V). In the worst case scenario, the maximum open circuit voltage output of the Sharp 123s (8 x 21.3V x 1.25 = 213V) won’t exceed the inverter’s maximum DC input voltage (which is 250V). When all is said and done, typically you get about ~75% of the nameplate wattage of a grid-tie system when the array is in full sun. There are several factors taken into account for typical system losses: dust, clouds, module power mismatch, temperature, wire loss, inverter inefficiency, etc. Under certain conditions (cold temperatures with bright sun), your solar array may make up to 25% more power than its nameplate rating--which helps counteract the system losses. The inverter may even limit (or ‘clip’) the power a little bit at such times. 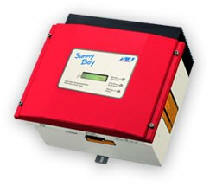 The Sunny Boy 700U is the smallest, batteryless inverter available to us at this time. If you are looking for more output or a battery-based system for powering important loads in an emergency situation, call us and we will design a system to suit your project, or e-mail us for more information.